It struck us while compiling this week’s selection that the band Raven have been around for 41 years. Fact: 41 years before that, Adolf Hitler was appointed Chancellor of Germany, the sale of alcohol was still illegal in the US, and the gangsters Bonnie & Clyde were on the run from the law. Time, eh? 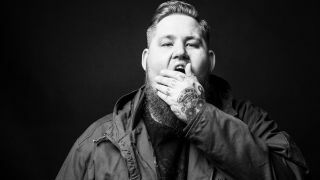 Rag’n’Bone Man - Hard Came the Rain Big-hearted soul n’ blues is the order of the day with Rag’n’Bone Man (Rory Graham to his mother). This beautiful beast of a track instantly became a favourite in the Classic Rock office – seducing everyone with its soft nuances and stomp-grooving blues rock riff. Oh, and Graham’s fabulous voice – sweet, sumptuous and mighty all at once. Palace Of The King - No Chance In Hell Palace Of The King is literally like a huge ground shaking Palace of RIFFS, SOUL and Rock’n’Roll,” says Joel ‘Airbourne’ O’Keeffe. Sound suggestion, then, that this isn’t going to be a quiet affair. And he does have a point – these bluesy Aussie hard rockers do riffs, soul and rock’n’roll very well. Brandish your air guitars people. Gill Landry - Funeral In My Heart A lovely shot of pretty, acoustically-rooted Americana. Louisiana-born singer, guitarist, storyteller, painter, photographer, hitch-hiker…OK the skills set on his press release is quite long, but still – Gill Lanry effectively channels edges of Steve Earle, Bob Dylan and others in this quietly poetic piece. Lush. The Crunch - Neon Madonna You want punk pedigree? We got it. Mick Geggus (Cockney Rejects), Dave Tregunna (Sham 69 & Lords of the New Church), and Terry Chimes (The Clash) are all part of this spiky conglomerate, whose Neon Madonna comes from the band’s brand new Brand New Brand album. Wolf Alice – Giant Peach If you ever wondered what happened to “Big Keith” from The Office, he shows up here. Perhaps he’s been in all of Wolf Alice’s videos, but we weren’t paying attention. Either way, Giant Peach is the kind of krautrocky thing we’re contractually obliged to refer to as featuring a “moterik shuffle”. Raven – Destroy All Monsters NWOBHM legends Raven celebrate their 41st year in the business of rock with the very thrashy Destroy All Monsters. We don’t know whether the song was named after the Detroit band or the Godzilla movie, but either way it’s an excellent addition to the athletic rockers’ rowdy repertoire. Thunder - Resurrection Day What can we say about Thunder that hasn’t been said before? Nothing. So we’re not even going to try. No, wait, we’ll try! Thunder are actually the secret identity of a group of five superheroes from the planet Huxxterryyyp 57. They live in a castle near Leicester, eat glass, juggle porpoises, and release new tracks only to keep the neighbours from getting suspicious. We Are Harlot - Never Turn Back “We all love guitar driven rock songs and that’s definitely where this one resides”, says We Are Harlot guitarist Jeff George, and by George, he’s right. Never Turn Back rocks like a truck. On a motorway. Going fast. At night. With a full tank of gas. Carrying explosives. Dangerous ones.